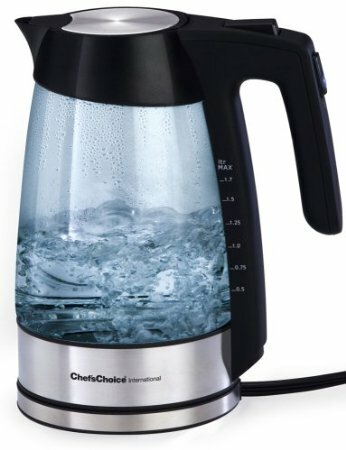 This 1500-watt electric glass kettle can quickly boil 1.75 quarts of water. It is made from brushed stainless steel for its bottom and 360-degree swiveling base while the carafe itself is heat resistant glass. The kettle automatically shuts off when the water has reached boiling point and the base remains cool allowing you to thereafter place the kettle on any surface for serving.